You have a story to tell. You are the only one who can write your story. Taking one or several steps in the writerly direction may offer you the necessary incentive to put your plan into effect. All the steps below are rich ingredients for a compost pile. With the right combination, the pile heats up and there’s nothing stopping you from growing gorgeous sentences that reach for the sun. Join or start a writer’s group. Keep a daily journal for three months. Take a break, then go for another three months. Etc. Join or start a book club. Read a book a week. Make notes on what you liked, and which authors to read more of. Read the book section of a newspaper: the weekend Globe and Mail, the Star, or the New York Times. Sign up on line for The Writer’s Almanac. It’s free, and brings wild ideas to your mind. Listen to people talking – at home, on the bus, at the gym. Record conversations. Listening (and remembering) is a lost art. Listen to a radio broadcast about books. For example, The Next Chapter on CBC with Shelagh Rogers. The immense variety of fiction and nonfiction spark the imagination. Interview your mother or father about their early years. Ask about feelings, sounds, smells, and the music they loved. Write up. Be generous. With yourself, with others, and with flowers. Nicely put, and thanks for the flowers. Thanks, Carol. One of these days I will present you with flowers in person. 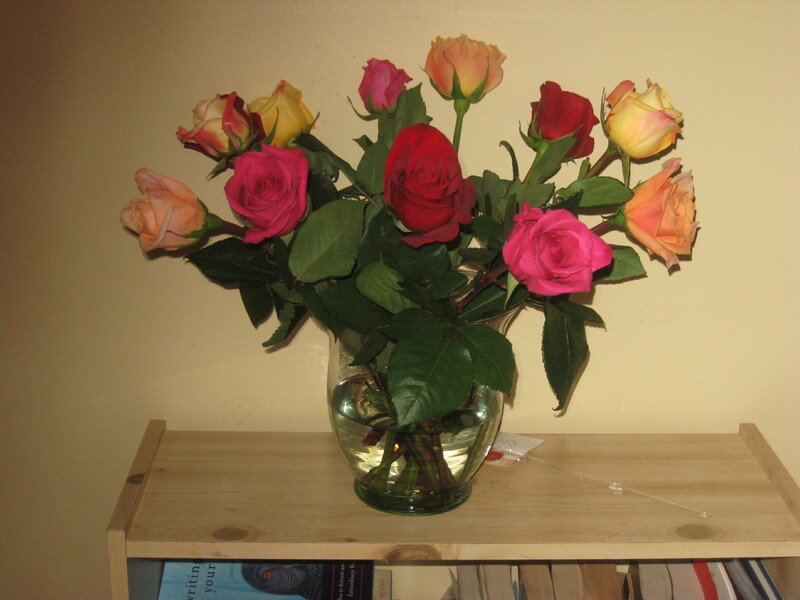 Thanks for the flowers, Diane, and for your wonderful blog! Thanks for visiting my blog, Sharon, and your lovely comment. Hope to see you again. I can attest to #1. I’m not surprised! Hope your memoir is nearing completion. Wonderful! Very useful suggestions, Diane. I already do a lot of those things but I haven’t ever thought of them in terms of enhancing a desire to write. They do enhance my life, though. Gallivanta, sounds good to me! I waited too long to do #9 with my father, which is a lesson I am trying to pass on to others in my book. I am happy to see it on your list. I am going to see what music my mother may recall. Maybe this will open up some memory doors for her. Thanks for the idea. Great idea, Karen, and let her listen to some music from her era, too. A wonderful documentary about the results this can have is Alive Inside. Congratulations on your published memoir! “Click on the book cover above to buy my book, or choose from one of the distributors below. The Gift of Memoir will guide you in writing the stories of your life. Remembrance in Memoir: What Does It Take? Does Your Name Tell a Story?